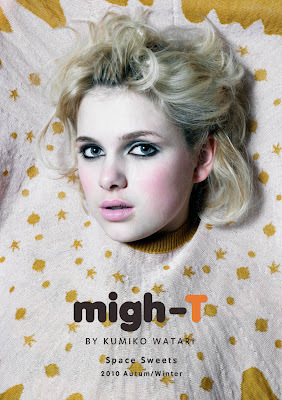 We have released migh-T 10AW collection "Space Sweets" at Who's Next Paris last month. TheAW10 collection entitled ‘Space Sweets’ features huge sweets flying through the universe on new pattern T-shirts and dresses. The prints showing doughnut meteors and whipped cream comets represent the massive freedom of childhood playfulness. The designs use different scales to show that there is no limit to your imagination. From doughnuts soaring through the Milky Way, to constellations showing faces in the sky, anything is possible.